Mallee Boys is a tender look at love, loss and family in the Australian Mallee. A contemporary farming community provides the backdrop to this heartfelt story. 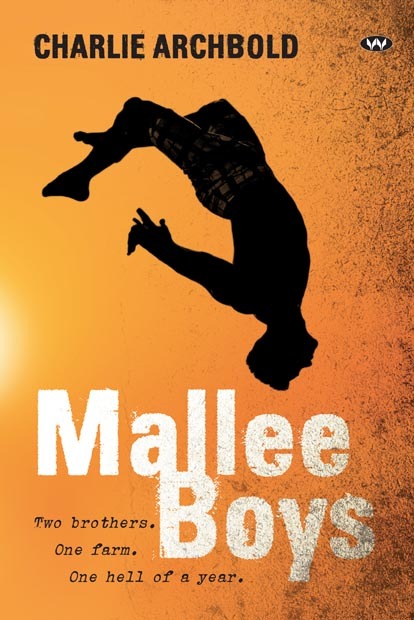 Mallee Boys follows fifteen-year-old Sandy and his eighteen-year-old brother, Red, over the course of a year. Their mother, Ellie, has been killed in a car accident and both brothers feel somehow responsible for her death. Red, because she was chasing him when she was hit by the car and, Sandy, because he was not with his family when the accident happened. Their father, Tom, plays an important role in the story as he does his best to make up for the gap left in their lives. Sandy applies for scholarships to boarding schools as a means to leave the farm and painful memories. Grounded in school life he tackles the pitfalls and pleasures of friendship and a first romance. The end of the story sees him attain his scholarship and develop a touching maturity. Red, embarks on a journey of self-destruction and finds companionship with petty criminal, Ryan. This unhealthy relationship is complicated by the fact Red falls for Ryan’s girlfriend, Lisa. Red also realises Ryan is stealing from farmers in the community. These events drive the story to a final dramatic car chase through the Mallee scrub. The ensuing accident leads to the climax of the story, Red’s admission to Sandy about his role in Ellie’s death. Sandy also acknowledges his own guilt and, supported by Tom, both brothers are all finally able to acknowledge their loss and begin to move forward. the hardest challenges, and most of all about being male. Mallee Boys is told from the alternating perspectives of Sandy and Red. The structure of the book makes it easy to follow and track character actions and motivations. The first-person text provides an immediate connection with the narrative. This is reinforced by the use of present tense throughout the book which creates an intimacy between the reader and the characters. Like scenes in a movie the reader is dropped in and out of conversations, actions and events. Rich in authentic dialogue the themes in the book are explored in touching and humorous ways. Mallee Boys is narrated through the voices of Red and Sandy and there are many examples of male voice within the text. Red-Chapter 18-Footy (117) There’s a deep instinctive feeling that comes when you are doing something physical. There are moments when I’m playing footy that my mind and body weld together. Winning is important to me. The story is set is a small agricultural community. The landscape holds an important place in the story. Tom-Chapter 32-Acceptance (Page 198) I know it’s the rhythms of nature that have kept me going. This isn’t a glamorous landscape, but it’s in my veins. And yours too, I hope. There are three pivotal moments in the story where each main character describes their version of what happened at Ellies accident and death. Sandy-Chapter 9-Exams (Page 56) When I kissed her goodbye that last time, I knew I had lost someone irreplaceable. My best possession had been stolen from me. The novel highlights the importance of friendship. Friends support both brothers as they work through one of life’s biggest challenges. Sandy-Chapter 7-Lake Bonney (42) Chris clapped me on the back. We never talk about Mum, but he understands. Red-Chapter 4-Mates (Page 95) In spite of all that has gone down between us, Ryan is still my mate and I couldn’t have got through all those months after Mum died without him. Much of the novel tracks Sandy’s journey to accept and move past Ellie’s death. It is a story about resilience. Sandy-Chapter 33-Graduation (Page 203) I know about missing people. I’ve missed my mother for nearly two years. But I also know you can get through it and you never, ever forget the people you’ve loved. Red-Chapter 20-Lisa (Page 135) There’s that phrase about the elephant in the room; something really massive and so important no one mentions it. Mum had become one of those elephants and I was the one keeping ger there. Family and community play a huge role in how the Douglas family manage their circumstance. While there are tensions in the family dynamic there is also a foundation of love and respect. They are also supported by the wider community. Sandy-Chapter 11-Arguing (Page 74) Now, most times me and Red get on alright. Since Mum though he’s been so unpredictable and fires up pretty quick. It’s hard. I try and let it go, because we’re only just coping. Sandy-Chapter 15-Stumping (Page 102) I think all the mums like to hug me because it reminds them they still have their boys and they’re gonna be able to watch them grow up. When I see everyone being so nice to us I realise just how special Mum was to them. While not strictly speaking a theme the use of humour in the novel adds a lightness to the grief the characters are experiencing. The ongoing presence of The Duke, a big brown snake, is one such example. Red’s risk seeking behaviour and impulsivity drive the narrative. Red-Chapter 4-Mates (Page 22) There was an arrogance and sense of danger to his invitation, but I was in. Doing things that give me a rush are good. They block out the crap. Sandy-Chapter 11-Arguing (Page 73) It’s actually very hard to concentrate with her so close. Her hair is up in a ponytail and the loose bits are curling around her neck. I’ve absolutely no idea what Mr Evans is talking about. Red-Chapter 22-Seriously (Page 143) Rejection. Whose voice did you most identify with and why? In what ways do Red and Sandy handle their grief and guilt over Ellie’s death? The dad, Tom, is a prominent character in the book. Why do you think the author chose to have such a strong adult voice and what impact does he have on Sandy and Red? Friendship plays an important part in the story. What are some of the ways friendship supports the characters and what are some ways in which it challenges them. Analyse and explain how images, vocabulary choices and language features are used in Mallee Boys. The setting of the book is in a rural/agricultural community. Do you think the story and character’s actions would be different in an urban/city setting? There are elements of humour in the book. Why do authors use humour when tackling complex themes such as grief, loss and guilt? How do Sandy and Red respond to peer pressure and manage risk taking behaviour? Sandy and Red are brothers and share a deep bond but they are different. Using examples from the text explore how they are similar and yet dissimilar. Look at their actions, responses, thoughts and words. At one point in the novel Sandy is asked to write about possessions. What are your thoughts on possession? What things/people are important to you and why? What happens when they are taken away?